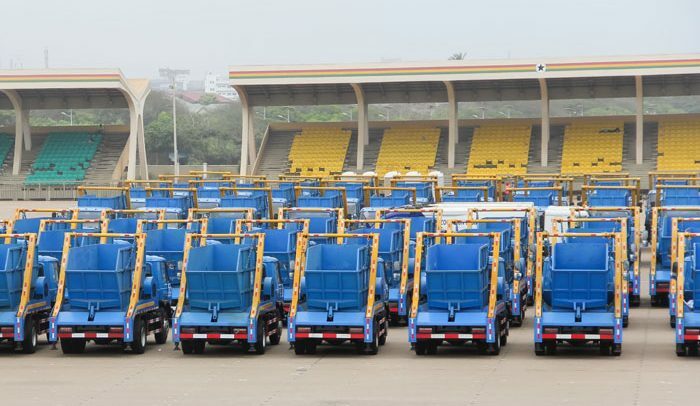 Zoomlion Ghana has presented 500 trucks to Metropolitan, Municipal and District Assemblies (MMDAs) to aid them in their day-to-day operations in the campaign for cleaner cities. The Minister for Local Government and Rural Development, Hajia Alima Mahama, who received the trucks for onward distribution to the MMDAs, entreated them as well as the general public to come together in the fight against poor sanitation in the nation’s capital, Accra, and other cities of the country. She said it was the responsibility of the various district assemblies in the country to ensure proper sanitation in the cities. However, the ever increasing rate of filth in the nation has called for a collaborative effort by all to combat the menace. She called on organizations within the private sector, at the ceremony held at the Black Star Square on Friday, to come on board and help in the campaign for cleaner cities in the country. The minister lamented about Ghana being rated among the top ranked countries as regards open defecation, saying it was an embarrassment. She disclosed that government is coming up with a project through the ministry to provide every household with a toilet facility – a step aimed at curtailing the menace of open defecation in the country. She urged landlords and property owners who do not have toilet facilities in their homes to provide space for the provision of toilets in their respective homes. She stressed that it was government’s desire to ensure that every household owned a toilet facility. Executive Chairman of the Jospong Group of Companies, Joseph Siaw Agyepong, said Zoomlion Ghana over its 12 years of operation has transformed the waste management industry in Ghana through the introduction of integrated waste management solutions.